Thanks Tom... I been going back and forth on whether or not to get it for some time... since I didn't know how much it differed from what I have to make it worth the purchase. But a couple other people told me the same thing here recently. So there is a very good chance of it being in my next order. This continuation of the adventures of the Man of Steel (Christopher Reeve) takes up where the original left off, showing spectacular new tricks to surpass it! 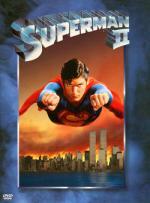 "I thought the original Superman was terrific entertainment," Roger Ebert wrote, "and so I was a little startled to discover that I liked Superman II even more." Three fugitive super-powered Kryptonian do-badders (Terence Stamp, Sarah Douglas and Jack O'Halloran) plan to enslave the Earth – just when Superman decides to show a more romantic side to Lois Lane (Margot Kidder). The timing is off for the son of Jor-El, but it's ideal for a special-effects fan's dream come true as Metropolis comes under siege. Gene Hackman (as Lex Luthor) also returns from the first film and with a top supporting cast, witty Richard Lester direction and visuals that astound and delight, this comic book-come-to-life has become an enduring all-family wow! Another one I really enjoyed. Christopher Reeve and Margot Kidder do a good job reprising their roles. I also liked the 3 Kryptonian criminals. I thought it was a great idea to make Superman face someone (or a small group as it is) as strong as he is. Even though I understand why they had to do it for the storyline... I never cared much for when Superman gave up his powers to be with Lois. The movie was almost boring in those scenes. But of course it really picked up afterward... and I really enjoyed the fight between Superman and the Kryptonian criminals. Though I do have mixed feelings on some of the new superpowers seen only in this movie... like Superman throwing the huge S logo... the white beams from their fingers... and the disappearing and reappearing in multiple places type things. Part of me thought it was pretty cool that they decided to do more... but another part of me felt it seemed a bit lame. Over-all it is a great movie that I enjoyed watching again. In this year... Raiders of the Lost Ark is released.... Tom Cruise makes his acting debut..... Van Halen's lead guitarist Eddie Van Halen marries One Day at a Time actress Valerie Bertinelli...After a 19-year run, Walter Cronkite resigns as head anchor of The CBS Evening News and is succeeded the following Monday by Dan Rather. Looking at the above list... 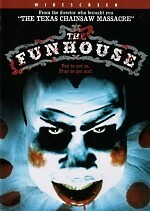 I am thinking of going with The Funhouse since I never seen it before... and it is one of the newest movies I just got. Though I am not planning on watching any more movies today... so that can change between now and the next time I watch a movie. Funhouse is a good choice Pete. Everybody know already it was shown the first time I did go to a theatre at 12 years old, so you could even watch it with Brittany since it's a "kid" movie (not in a negative way) and I'm sure she would enjoy it too. I actually asked Britt if she would watch it with me. And she completely refuses because of the clown on the cover! She is so terrified of clowns it's ridiculous! I know the film happen at an amusement park, but I can't remember if the clown part is that important since I haven't seen it since I was 12 years old (wich was some times ago for me ). If there is not much of the clown in it then she may watch it. But she won't watch it with me till I can tell her for sure. I was in the living room a few days ago... holding her hand and asking her to watch an episode of Supernatural with me. I should have let go of her hand before telling her it was about an evil clown spirit... she got all upset and nearly twisted my fingers off! Well... don't look like it will be in my next order. I went to Amazon when I posted the above. It was $8.99... so I put it in my cart for when I can order next. I got up this morning and it jumped from $8.99 to $19.99! Movies can go up without a moment's notice. One Blu-ray disc I pre-ordered about a week ago was about $26 at the time...now it's priced at $32. Since I did place my order when it was cheaper, I'll get it at that price. Yeah... I know what you mean. But I must say an $11 hike in such an old release caught me by surprise! Not relevent to your case Pete, but this is why I pre-order the large majority of my movie. With Amazon I'm sure to get the best price between the day of my order and the day of shipping, also after the pre-order period the dvd price jump higher so my price is lock. Yeah... I will have to check the Marketplace once I am ready to place an order. It seemed to be a carnival funhouse just like any other: mysterious, eerie, scary, but all in good fun. Yet it wasn't just any funhouse. In this one there was murder. And the horror became real. The story concerns four teenagers who visit a local carnival for a night of innocent amusement. They soon discover, however, that there is nothing innocent or amusing there at all. Instead, they find absolute terror when the four are trapped inside the maze of the funhouse. One by one, each victim is taken by a monster who tauntingly stalks them. I just got this movie the other day in the Cult Horror Classics: 4 Movie Marathon DVD set. This is the first time I ever seen this movie. Which in of itself is a surprise... because as a teen I lived on the '80s horror. I enjoyed this one. I have seen better... but it did a pretty good job of entertaining. I enjoyed the story... but I wish they would have did a little better job on designing the deformed look of the killer. I am not quite sure why they chose an evil looking clown for the cover image. There really wasn't much of any clown scenes. So my daughter (who is very afraid of clowns) has no reason to worry about this one. In this year... Michelle Pfeiffer makes her film debut in Grease 2.... During production of Twilight Zone: The Movie, 53-year-old American actor Vic Morrow and two child actors were accidentally killed during a scene involving a helicopter..... The THX Sound System is developed for use in movie theaters...Singer Jermaine Jackson guest-stars as Tootie gets to meet her idol on a very special The Facts of Life. My daughter and I have talked about watching the Richard Pryor movie The Toy together since I got it. So this may be a good time to watch it next. For the first time in motion picture history, the outrageous talent of Richard Pryor and the ingenious comedic sense of Jackie Gleason are combined in the same film. Gleason is U.S. Bates, a megalomaniac millionaire who owns most of south central Louisiana. Pryor is Jack Brown, a former journalist who has worked his way down the vocational ladder to the position of janitor in Bates' department store. Among Bates' other vast holdings is a young son Eric (Scott Schwartz), who visits his father for one week a year. Typically, Eric is chauffeured to the department store after-hours to pick out anything he wants. This time, Eric has a more elaborate toy in mind – Jack Brown. So begins the unique relationship that teaches Eric more about life than fun and games. This is a movie I haven't seen in many years. The last time I saw it I was still a teen. I remembered enjoying it at the time... but I forgot how funny I found this movie. Despite the changes in times... what with making such a big deal about him being a black man and all... I found I still enjoyed every minute of it. This one I watched with my daughter... and we both laughed so hard at this movie that we nearly had tears come to our eyes. I even had to pause it once to let her run to the bathroom so she would pee herself laughing so hard. Which of course got me laughing even more. Anyway like I said... it was a lot of fun re-watching this movie after so long. Unfortunately the DVD leaves a lot to be desired... as I have the re-release of the Pan & Scan version only. And only extras are some bonus trailers for other movies. But still well worth watching!